Pharonik Pilates is a beautiful studio, fully-equipped with professional Pilates apparatus, including: the universal reformer, tower/trapeze table, wunda chair, hi-chair, ladder barrel, ped-o-pul, and a variety of other small equipment. We also have a dressing room/bathroom on-site along with complimentary towels & water for our clients. Magda trains Super Bowl 50 Champion Omar Bolden, safety and punt returner of the Denver Broncos (2012- 2016). Fitness and wellness are key to happiness! And true fitness comes from an exercise program that develops the body uniformly, and encourages movement in all ranges of motion. We passionately teach the many nuances of each movement and exercise so our clients experience the full benefit of Pilates as developed by Joseph H. Pilates. We know that Pilates benefits every BODY, and we love showing each and every client how Pilates can work for them. 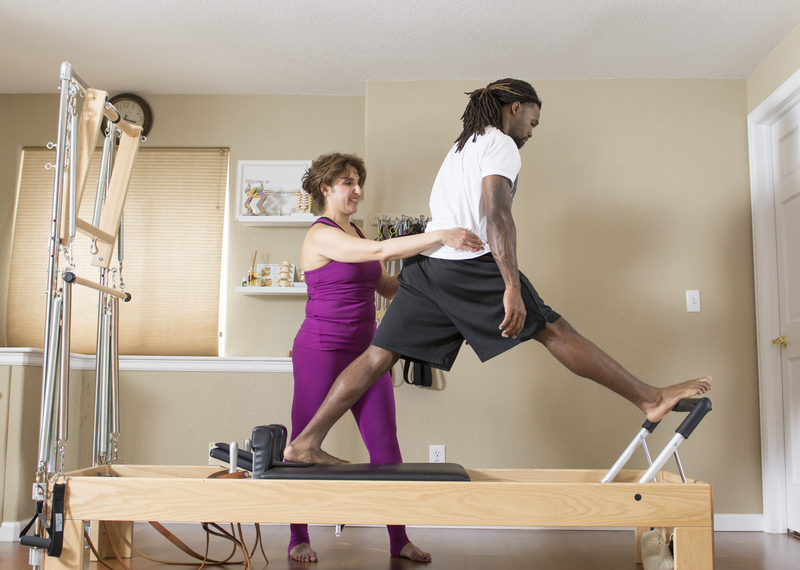 Whether we're training players from the Denver Broncos, helping our clients rehab an injury or working on building muscle tone and strength, we are endlessly excited to see the power of Pilates come to life! Magda is the owner and instructor at Pharonik Pilates. She discovered Pilates after the birth of her first child. During her first pregnancy, she gained 80 pounds. After having her child, Magda worked vigorously to lose the weight. She performed all kinds of exercise activities including running, aerobics, spinning, weight lifting, etc. After training for about 15 months, Magda discovered Pilates. As she continued to include Pilates into her exercise regimen, she noticed how much quicker she was able to achieve her pre-pregnancy weight goal. Furthermore, she enjoyed how it made her feel. "It gave me a great sense of flexibility and ease in movement as I did things throughout the day. After performing Pilates, I always felt as if someone had magically put oil on my joints. Also, it provided me with more leaner and toned muscles while providing me more flexibility." Magda is a third generation descendent teacher of the Pilates method and has trained over 8 years with Cara Reeser, a disciple of Kathy Grant, who was a direct protégé of Joseph Pilates. Magda completed the Kathy Grant Heritage Training Program under Cara Reeser in 2012 and she completed her Advanced Master’s Program in Pilates from the renowned Pilates Center of Boulder in May 2016 with Rachel Taylor Segel and Amy Alpers. [Rachel and Amy trained under Romana Kryzanowska, Joseph Pilates' protege and inheritor of his studio in NYC]. Magda finds Pilates inspiration in her travels to Egypt! Magda's clients rave about her contagious passion and great communication. Her love of teaching is evident as she makes every client feel welcome and supported. And she knows exactly how to personalize each session and help her clients achieve their goals.